Looking at Belisario Contreras's drawings with Peter Harrington, curator of the Anne S.K Brown Military Collection. When I began work on The Ghost Army project more than ten years ago, I had no idea that it would end up branching out in so many unexpected directions. Work on the documentary led to the museum exhibit, the Ghost Army tour, and the new book being published by Princeton Architectural Press in 2015. 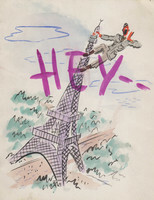 Yet another important facet of the project, and one that I consider especially important, is the effort to preserve and curate artworks, documents, artifacts and ephemera relating to the story. As part of that effort, I am thrilled and honored to have been able to help arrange the donation of 28 wartime drawings by Ghost Army soldier Belisario Contreras to the Anne S.K. Brown Military Collection at Brown University. The works were donated by his widow, Marta Contreras, with the assistance of her niece, Rosa Bland. 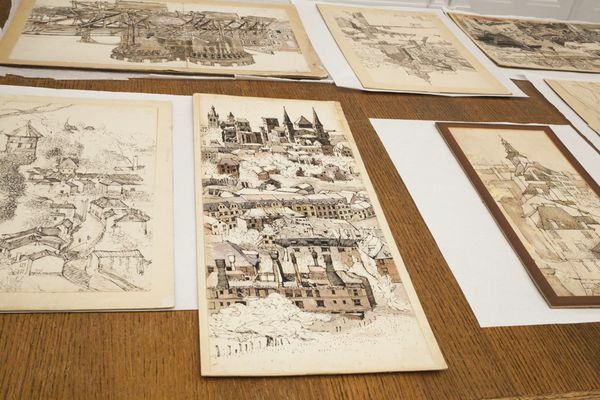 “I think that Belisario will be happy to know that we found a home for this priceless collection,” said Bland. The donation also includes assorted photos and documents relating to Contreras’ wartime service. The Brown collection is now home to the artworks for four Ghost Army artists: Bob Tompkins, Richard Morton, Walter Arnett, and Contreras. 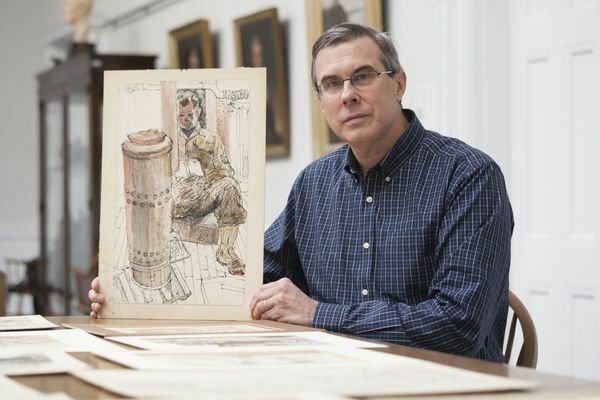 "We hope to add additional pictures from 603rd artists in the future to create a fitting and lasting memorial to the work of this special and unique unit," says curator Peter Harrington. 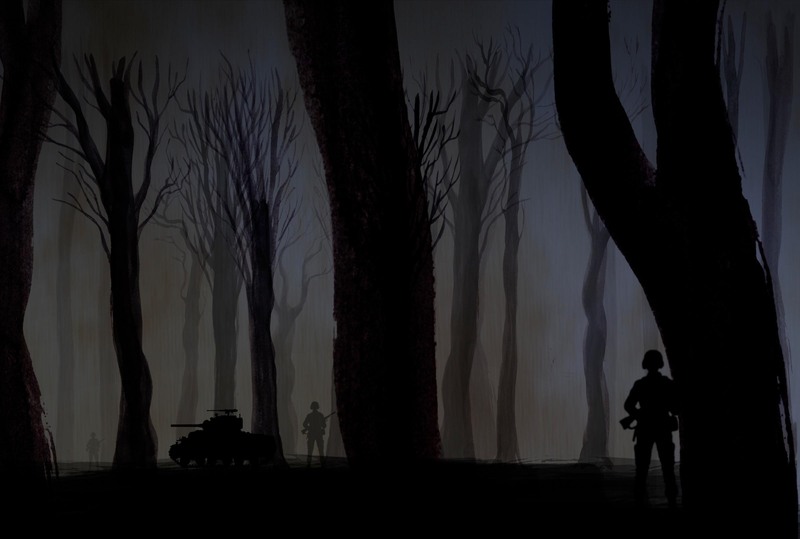 One reason I believe Brown is a great home for Ghost Army artworks is their robust web presence – they are working to put their entire 15 thousand piece collection online, so it can be viewed around the world. 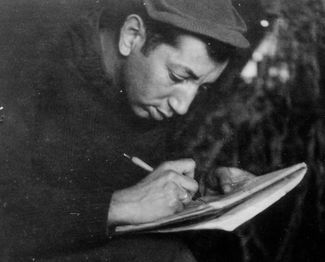 Contreras was born in Chili and grew up in the U.S. His fellow soldiers in the 23rd admired his work with pen and ink. “He was a master at the art of taking lines, putting them together, and making visual sense out of them,” said Ned Harris. After the war he worked as an artist for the U.S. State Department. He received a PhD in history from American University in 1967 and wrote the book Tradition and Innovation in New Deal Art. He died in 1990. 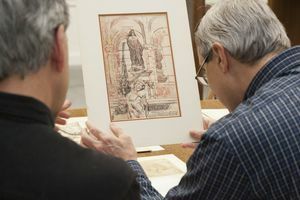 I visited Brown in November to look over the Contreras drawings with Peter Harrington. 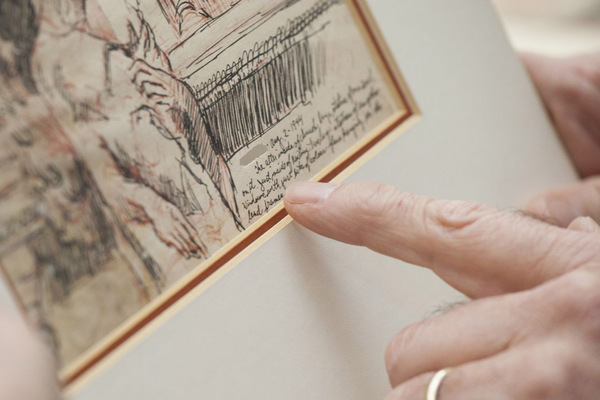 You can learn so much by examining the original drawings. For instance, you can see that in this August 2, 1944 sketch of the church in Trévières France, that the name of the town has been cut out. That means that Belisario probably mailed this drawing home, and the censor scissored out the location. All photos by Mara Brod.